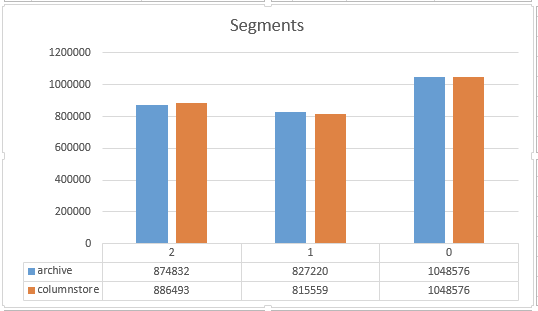 In the previous blog posts of this series on Clustered Columnstore Indexes, we have created some Clustered Columnstore Indexes and NonClustered Columnstore Indexes, we have compared different type of compressions and we have even considered some of the internals of the Columnstore Indexes. Now it is time to play with some data and see how what we can actually see and discover by looking at the internal information of the SQL Server 2014 CTP 1. What can we see there ? From 11 columns available inside of the dbo.FactStrategyPlan table, only 9 columns have deserved their right to have a dictionary. The very first columns is an Integer Identity and so far I have seen, Columnstore Indexes does not create any dictionaries for this types of columns. Another columns which did not receive any dictionary was a column Number 8, which has a MONEY datatype. At this point lets just remember it and move forward. The second DMV returns us information about data distribution between compressed Segments. We can see that the columns 1 & 8 don’t have any primary (I assume that it means a global dictionary) dictionaries associated. Notice, that no Columns have any secondary dictionary at all (I assume that this means a local dictionary). The last of the 3 consulted views (sys.column_store_row_groups) is showing us information about all available Row Groups, and in our case they are all compressed Segments. 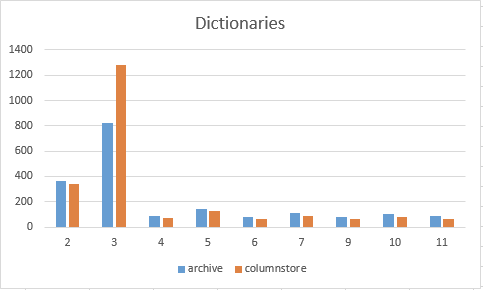 The results from the DMV’s of the Nonclustered Columnstore Index are very self-explanatory: The dictionaries are absolutely identical, and so from here I assume that the data analysis is the very same process that has been used for the Clustered Columnstore Indexes. 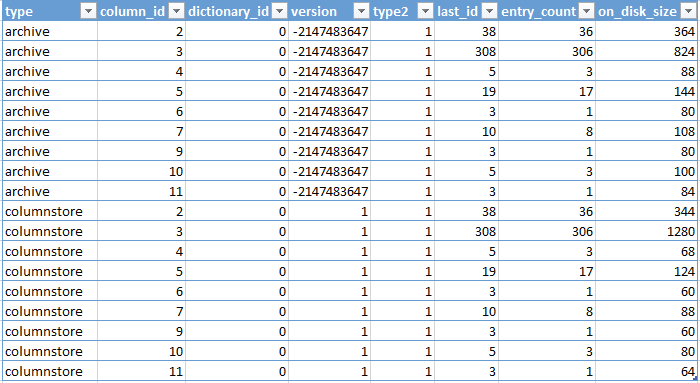 The segments are different to the Clustered Columnstore Indexes: first of all we have a 12th column, which actually does not exist in the original table. What does it serve for ? In our case this is a unique identifier to serve as a connection between the clustered and so is the occupied space, like there is one for the traditional Nonclustered Indexes build on a HEAP. Naturally the Row Groups DMV is showing us the aggregated info which is involving all Segments, because we don’t have any other type of the Row Groups. As expected, the dictionaries stays the same – untouched. 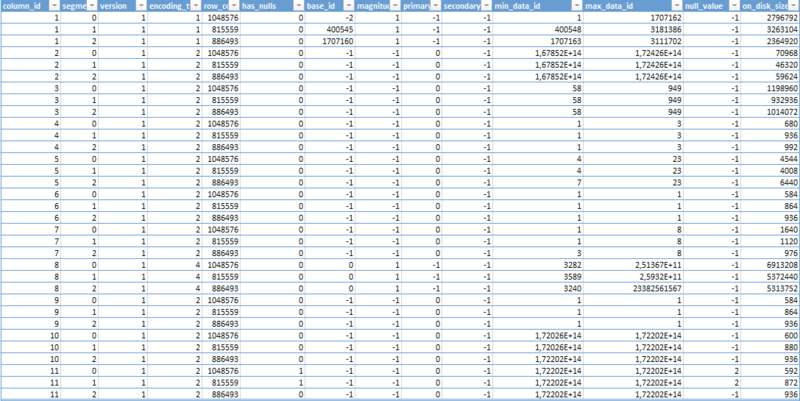 For the sys.column_store_segments DMV – also, as expected the 12th columns is completely gone and the results are quite different: The compression results are much better, which definitely should be attributed to the sorted order of the data, since we have built a traditional Clustered Index before creating a Nonclustered Columnstore one. The results are absolutely equal, which makes perfect sense. At this point I am quite confident that this combination (Clustered + Nonclustered_Columntore = Clustered_Columnstore). Viewing the results of the DMVs proves that in my opinion. I have tried a couple of other tables and always have obtained the exact results. Analysis: The Columnstore Archival process is not only just a modified LZ77 compression. The dictionary size is clearly differs from the default Columnstore compression. In the case of the Columnstore Archive compression, for the majority of the columns the size of the dictionary is somehow bigger then in the default Columnstore compression by the precise amount of 20 bytes. The only case when the Columnstore dictionary is bigger then the Columnstore Archive – is the column number 3: EntityKey int. The difference is so significant in this case, that there is something going on and at this point I am not sure what exactly is. I am definitely looking forward into trying to get a look into the dictionary values to understand this difference. This column is an Integer, which in a lot of cases does not get any dictionary at all, but since we have just 306 distinct values it is clearly a column that can get a good compression.